Hello I want to make the text to write in a circle and not outside the circle, how can I do that? 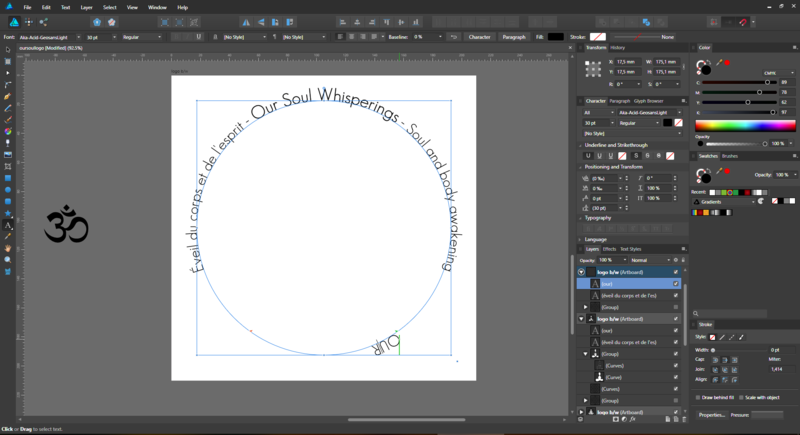 Here is the text outside the circle with using the text tool, I want it to be inside the circle (and as a result the text at the lower part to be read right and not be upside down), in illustrator I was dragging the symbol at the beginning of the path and pulled it inside the circle but I can't replicate this here. Press Enter after the initial text you want on top of the circle to place the rest inside the circle (adjust its position using the handles if necessary), then select the text on bottom and use the Baseline control in the context toolbar to move it to outside the circle keeping it upright if you want to keep both top and bottom texts aligned. An easy way to get the text perfectly entered on to and bottom is to select the circle, then go to menu Layer ▸ Convert to Text Path, type the text you want and press the Centre Align button in the context toolbar to centre the text on top, press Enter to move to the bottom part and write the bottom part of the text (should be already centre aligned) then use the Baseline control in the context toolbar to move the bottom text to outside the circle.